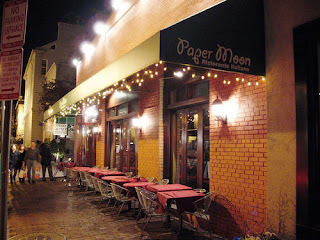 Friday was a friends’ birthday dinner at Paper Moon in Georgetown (http://www.dc-papermoon.com/). The restaurant looks like a small café from the outside, but inside it is actually really big! The high ceilings and open front make it feel spacious, and reduce the noise level. We had a reservation for 10, and were quickly seated on the balcony level. Our plan for the evening was a long luxurious dinner in honor of 2 birthdays. All of the attendees were young women relatively new to the DC area – it wasn’t a “networking” thing (I really hate that term), but I was extremely impressed with all those in attendance. Everyone was really intelligent and interesting! It was a gathering of the straight-A’s, study abroad, amazing internships and great job potential types – the up-and-coming women of DC type of thing. Two girls worked together in a lobbyist organization http://www.globalsolutions.org/, one was at the World Bank, others were applying to graduate programs, the Peace Corps, etc.. Most of us did not know each other beforehand, but it was a really fun evening of great conversation! Anyway, back to the restaurant: we were planning on a long meal, so we didn’t notice that the food took forever. There was a big bridal party downstairs, so I think that contributed to our semi-neglect. That also potentially accounted for the quality of our food when it did arrive – I ordered a scallop pasta with tomato pesto sauce. It had so much potential, but my pasta was WAY overcooked (like almost mushy). The eggplant parmesan was not right – the eggplant was chewy. They also completely forgot one of our orders, so when the last dish came out it was obviously thrown together thoughtlessly at the last minute. The food felt like an afterthought – which it probably was. It was ok, but not great, and considering that the bill was over $300, it could have been much better. The restaurant turns into a “club” with live music at 11:30, but we decided not to stay that long – it was a much older crowd, and us movers-and-shakers had to get moving! After a late start (aka I slept until 9:30) I went for a long run and then proceeded to venture out to a ridiculously long day! I walked to the National Portrait Gallery from Dupont, walked up and down and all around the exhibits, and then walked to a friends’ apt. on 29th Street near the Woodley Park metro. as well as the permanent America’s Presidents http://www.npg.si.edu/exhibit/current.html. I kind of hate to say it, but I think that the first George Bush has the best portrait. Anywho, after museum-ing it up, I went to help a friend move. After transferring boxes, (and encountering some RIDICULOUS individuals along the way), the three of us were getting a little hangry (hungry+angry, a term coined by my good friend Jess, and a common theme in my life). 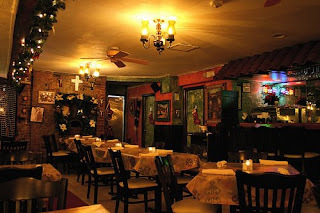 I loved the décor, the walls were painted and textured, and there were Mexican decorations everywhere. Unfortunately (due to our hangry state), the food took FOREVER! To give them credit, our server did inform us that it might take 20 minutes because they had a big party that just ordered – but really, 40 minutes is excessive! On the bright side, the chips were light, fresh and delicious, and when we finally got our food it was a good large-portioned Mexican experience! The tamales were a bit mushy, but the enchiladas were fantastic! And inexpensive – $9.99 and that included sour cream and guacamole (I really think it is a crime when places charge extra for those essentials). I will definitely go back here to satisfy my California-raised Mexican food cravings! Sunday involved a Chinese film at the Freer-Sackler Gallery as a part of the annual “Made in Hong Kong Film Festival.” Let’s just say that I will probably not opt for Chinese film again. The good news is that I made an AMAZING banana cake – more on that tomorrow!